Who Is Your Brand Soulmate? Ok, here's the thing: we all have brands that we love! For the most part, I love brands that keep things simple and classic, like Apple, Acure, and Birkenstock. See, I'm a pretty basic b (in a good way). I tend to wear plain black, white, and gray shirts/tank tops with yoga pants, leggings, or jeans. I have black ballet flats that I love, gold Birkenstocks, and simple black and brown boots for winter. Ok, I have some flashy things that I love too, like my hot pink heels and my Dolce & Gabanna dress - but even those are fairly simple. Because I tend to lean more simple and basic, I've kept my brand the same way. Sure, I LOVE some of the branding other copywriters do (looking at you Misha, Kira, and Hillary) but it just isn't me. You have to know who you are to be able to write for your business - or to hire someone to write for you! 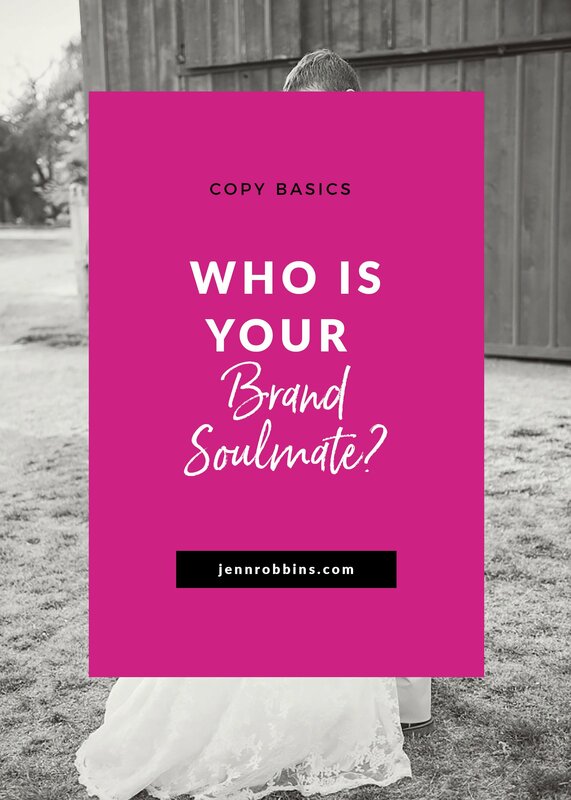 If you aren't sure who you are (it's not like that's an easy question, after all), the best place to start is by identifying your brand soulmates. The good news is that it's way easier than finding your IRL soulmate - if you believe in that kind of thing. So, why do you need to know who your Brand Soulmates are? Because they will help you figure out who you are and who your ideal audience is - and maybe even become a source of friendships and referrals some day! The first step is to think about brands you love. I listed some of mine above, but start thinking about who you love. You can write them down, or just picture them in your mind. Next, think about why you are drawn to them. Are they witty? Funny? Controversial? What do their brands look like? Bold and bright? Simple and elegant? Ethereal and dreamy? How do they make you feel? Write down why they inspire you. Now look at where your potential Soulmates hang out. Odds are they are in the same places your Ideal Audience is, but write it down to make sure to compare. Finally, think about how you can interact with them. If you already talk with them, great! If not, think about how you can get to know them organically. Are you in the same Facebook groups? Twitter chats? Mutual friends? Find a way to casually introduce yourself. Not everyone on your list will be a soulmate, and that's ok. Take some time and narrow down your influencers, advocates, and colleagues.